On April 16th, the Wall Street Journal published a story that U.S. officials had approached Saudi Arabia, Qatar, Egypt, and the United Arab Emirates about contributing troops and funding to establish a regional force that President Trump hopes will take over the U.S. role in the Syria conflict. The force would be tasked with securing the large stretch of Syria east of the Euphrates River currently controlled by U.S.-backed local Arab and Kurd troops, to prevent the territory falling into the hands of a resurgent Islamic State or Iranian-backed forces once American troops depart. The U.S. has about 2,000 troops in Syria engaged in the war against ISIS, and backs a force of Arabs and Kurds that has regained a large stretch of the country from ISIS, including valuable oil and gas fields. The UAE and Saudi Arabia are part of a coalition fighting an insurgency in Yemen while Egypt is battling extremists domestically with the help of Israel. Qatar, meanwhile, has been the subject of an embargo by the other three states since last June. Though asking Arab states to contribute more to the fight against the Islamic State in Syria is reasonable, expecting a regional force consisting of Saudi Arabia, Qatar, Egypt and the UAE to do so is somewhat fanciful. 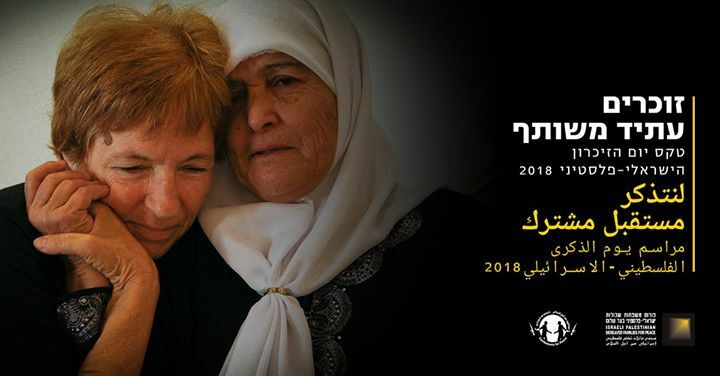 A flyer shares information in Arabic and Hebrew for the Israeli-Palestinian Memorial Day Ceremony that took place on Tuesday, April 17 in Tel Aviv. On Tuesday, 6,800 Israelis and Palestinians on both sides of the political divide came together in Tel Aviv to mourn and acknowledge each other’s grief for loved ones killed in the conflict at a joint Memorial Day ceremony. The annual event, first held in 2006, is organized and sponsored by two organizations committed to bringing an end to violence between Arabs and Israelis: the Parents Circle-Families Forum, a group of bereaved Israeli and Palestinian families that work together for reconciliation, and Combatants for Peace, an organization of former Israeli soldiers and Palestinian militants. For Israelis, Memorial Day is an occasion to mourn the country’s fallen soldiers and victims of terror; many object to the idea of Israelis and Palestinians joining together in grief and protesters could be heard during the ceremony. Prior to the event, Israeli Defense Minister Avigdor Lieberman, who called the joint event insensitive and in “bad taste,” tried to prevent bereaved Palestinians from attending but the High Court ruled against him after the organizers appealed his decision. Senators continue to push back against U.S. financial and material support of the conflict in Yemen, Aljazeera reported. Both Republicans and Democrats have claimed that the Trump administration lacks a coherent strategy in Yemen as they questioned Department of State and Pentagon officials during a Senate Foreign Relations Committee hearing on Tuesday. Senators have raised concerns about high numbers of unintended civilian casualties in the impoverished country. Ambassador David M. Satterfield, the State Department’s Middle East Envoy, told the panel that U.S. “military support to the Saudi-led coalition supports important U.S. national security and diplomatic objectives,” which include the defeat of Islamic State and Al-Qaeda in Yemen, as well as containing Iranian influence in the region. Until now, successive administrations have used the Authorization for Use of Military Force (AUMF) (S.J.Res. 23) by the United States Congress on September 14, 2001 — which authorizes the use of United States Armed Forces against those responsible for the 9/11 terror attacks — to justify military support and intervention in a variety of conflicts throughout the Middle East. The authorization granted the president the authority to use all “necessary and appropriate force” against those whom he determined “planned, authorized, committed or aided” the September 11th attacks, or who harbored said persons or groups. The AUMF was signed by former President George W. Bush on September 18, 2001. In December 2016, the Office of the President published a brief interpreting the AUMF as providing Congressional authorization for the use of force against al-Qaeda and other militant groups. Some lawmakers have suggested that the AUMF is being used too broadly and allowing the president to circumvent legislative authorization. Reports show that child marriage among Syrian refugee children in Jordan, primarily girls, is on the rise, according to data from the country’s court system. The percentage of child brides in Syrian marriages in Jordan rose from 15 percent in 2014 to 36 percent this year. Poverty is the primary reason driving families to marry off their daughters. Last year, Jordan’s chief justice issued new stipulations allowing girls the right to demand a marriage contract with conditions including completing their education and working but the United Nations says more work must be done to keep girls in schools. On the other hand, on Tuesday, several hundred Syrian refugees left Lebanon to return home after receiving news from their families that it was safe to do so. It was an unusual instance of voluntary repatriation to what remains one of the world’s most notorious war zones. Around 500 people, including children and the elderly, left the Shebaa area of southeast Lebanon for the district of Beit Jinn, southwest of Damascus. They decided to return more than a month ago, but waited until weather conditions improved before making the journey. The convoy of 15 buses, adorned with posters of Syrian President Bashar Assad, was organized by the Lebanese government, with the UN refugee agency insisting that it had played no part in the arrangements. UNHCR spokeswoman Lisa Abou Khaled told Arab News that the agency had only visited the returning Syrians to make sure they were going home voluntarily, but had not checked the situation in Beit Jinn. She said the refugees said they were returning to Syria because living conditions in Lebanon were difficult and they wanted to reunite with family. A senior official in Iran was arrested on Thursday after a video posted online showed young boys and girls dancing during a musical performance at a mall in the conservative, northeastern holy city of Mashhad, according to the judiciary. “The head of the ministry of culture and Islamic guidance in Mashhad was arrested for undermining public decency and disrespecting the laws,” said the Mizan Online news agency, quoting a deputy prosecutor. Islamic law in Iran prohibits public dancing. A spokesperson for the mall claimed the singer had the necessary permits to perform at a monthly event that can draw up to 12,000 spectators, but officials disagreed and one local religious leader even banned concerts in 2016. Closing on a lighter note, since Saudi Crown Prince Mohammad bin Salman publicly stated last month that the black abaya worn by women is not mandatory, it seems colorful versions of the traditional outer garment that is worn outside the home have become more common. “The laws are very clear and stipulated in the laws of Sharia: that women wear decent, respectful clothing, like men. This, however, does not particularly specify a black abaya. (It) is entirely left for women to decide what type of decent and respectful attire to wear,” Prince Mohammad told CBS Television last month during his tour of the United States. Women in Saudi Arabia have hardly been consigned to wearing a uniform black robe, despite whatever impressions outsiders may have: malls and markets across the kingdom are stocked full of infinite abaya possibilities that include embroidered and jeweled patterns, contrasting fabrics and shades, and trendy styles, whether grandiose or understated. A Muslim cleric also recently dismissed the view that black was the only color for abayas permissible in Islam. “The cloak is meant for maintaining a modest look and it does not have to be black,” the former chief of the religious police in the holy city of Makkah said last month. But whether these announcements have led to greater diversity in fashion choices or the men are simply responding to facts on the ground is up for debate. Even before MbS or the cleric made their statements, women in Saudi Arabia have had their own ways of expressing their personalities and identities, either sartorially or otherwise. “The colorful abayas started in Jeddah and this fashion trend is moving slowly towards the rest of Saudi Arabia,” says Saudi fashion designer Effa Al Dabbagh, who is from Jeddah, on the country’s most cosmopolitan west coast, and has a boutique in Dubai, called Effa. “This past year, the colored abayas became more widespread, especially among the younger generation, where you see them wearing neutral pastel colors, like grey, khaki, sky blue, yellow.” A Reuters report on students enrolled in the film program at the private women’s college, Effat University in Jeddah, has a gallery of photos highlighting their innovative studies, and some of the latest fashion trends. Saudi women study film making at Effat University in Jeddah. ‘Everything is about to change,’ a first-year student of ‘visual and digital production’ at the University says. Picture taken March 7, 2018. REUTERS/Yasser Bakhsh.